A credit union is a not-for-profit financial cooperative owned and operated by its members. The members pool their financial assets to provide funds for loans to themselves and their fellow members. In addition, the credit union offers a wide variety of financial services. Credit unions are financial cooperatives which service groups of people who share something in common, such as where they work, live, attend school, volunteer or go to church. As a cooperative, a credit union is unique in the financial world. Credit unions exist to serve their members. The credit union is owned and directed by its members and is dedicated to the credit union philosophy of people helping people. Rather than paying profits to stockholders, credit unions return earnings to members in the form of dividends and improved member services at rates frequently more favorable than available at commercial lenders. Northland Area FCU offers its members the ability to have up to 100 different accounts. The accounts can be used for a college fund, Christmas savings, checking, vacation, home purchases, retirement, etc. The only requirement is that you need to be a member of NAFCU and have a minimum of $5.00 on deposit at all times in your primary share. 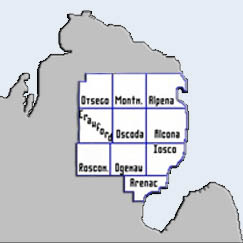 Persons who live, work, worship, or attend school in and businesses and other legal entities located in Alcona, Alpena, Arenac, Crawford, Iosco, Montmorency, Ogemaw, Oscoda, Otsego or Roscommon Counties in Michigan; and also included are spouses of persons who died while within the field of membership of this credit union, employees of this credit union, members of their immediate family or household, and organizations of such persons. Make the switch easy! Get our new account "Switch Kit." In 1957, a small group of people gathered in an office on Wurtsmith Air Force Base to discuss the possibility of starting a credit union. After extensive discussions with federal regulators and a Michigan Credit Union League consultant, it was decided a credit union would be of great benefit to U.S. Air Force personnel, their families, and government employees working on Wurtsmith AFB. With great expectations, each person present offered a contribution of $5.00 and with less than $100.00 total, Wurtsmith Federal Credit Union was born. On October 23, 1957, the doors opened to a total of 48 members. From that day forward Wurtsmith encountered many changes. By 1964, the credit union reached the million-dollar asset plateau, and because of its continuously growing membership, the credit union moved off the Air Force base in 1969. In 1977, after merging with Oscoda Sacred Heart CU and Tawas Community CU, our charter changed and Wurtsmith Federal became Wurtsmith Community Federal Credit Union. After the closing of Wurtsmith Air Force Base, it was decided that we needed a new name which would more accurately describe the total membership. On October 1991, our name was changed to Northland Area Federal Credit Union. Since 1957, it's been our privilege to serve the people of Northeastern Michigan. For 60 years our guide has been a simple one - Not for profit, not for charity, but for service. The same credit union motto that has embraced a shared philosophy of values for over 100 years. With this single principle at our helm, we have grown. We are honored to be a 100% member-owned credit union - now over 43,000 members strong. The mission of Northland Area Federal Credit Union is to be our members' most trusted financial partner.